Today’s recipe comes to you from a little segment I like to call My Dad’s Cooking. 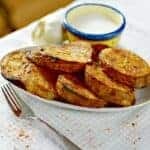 He came up with these grilled potatoes on Memorial Day, the perfect time to test if this recipe would be a crowd pleaser – and it was! Not only did we run out of these grilled potatoes last weekend when we made up a batch for a backyard BBQ, we actually had people bargaining for them at the dinner table. Like currency. These grilled potatoes are so good, they can actually be used for currency! …Ok, maybe not in real life. But definitely try trading up a few of these bad boys at your next BBQ. I might even try it at poker night on Friday. I’m pretty sure this will go well. So, without further adieu, my dad’s grilled potatoes recipe! These potatoes are an easy, tasty side dish for the next time you fire up the grill. Feel free to add herbs like basil or oregano, and serve with your favorite grilled entrée. The potatoes are meant to marinate for an hour, but you can cook them immediately if you don't have time. The longer they sit, the more flavor they will have. Cut potatoes into thick slices, about 1/2-inch each. Add potato slices to a large bowl (or Ziploc bag). In a mixing bowl, add olive oil, water, onion powder, paprika, kosher salt and black pepper. Stir all ingredients together until combined. Pour oil and spice mixture over potatoes. Stir potatoes until well coated with oil and spice mixture. Cover bowl (with plastic wrap) and place in refrigerator for 1 hour. After one hour, remove potatoes from refrigerator and place each slice on a medium-high heated grill. Cook for 4-5 minutes, then turn slices over and cook for an additional 4-5 minutes, or until a fork goes through easily. Remove from grill and serve. Nutella Chocolate Chip Cookies - Gluten Free! Lovely dish. I will try this grill dish. These remind me of the potatoes my mother used to make as a side dish with fried fish and dhal sauce. Your dad’s a genius! I’m sure I’ve never cooked potato slices directly on the grill. How fab! Oh, he’s going to be so happy to read this comment! lol Thank you! I’m always looking for a new thing to do with potatoes. 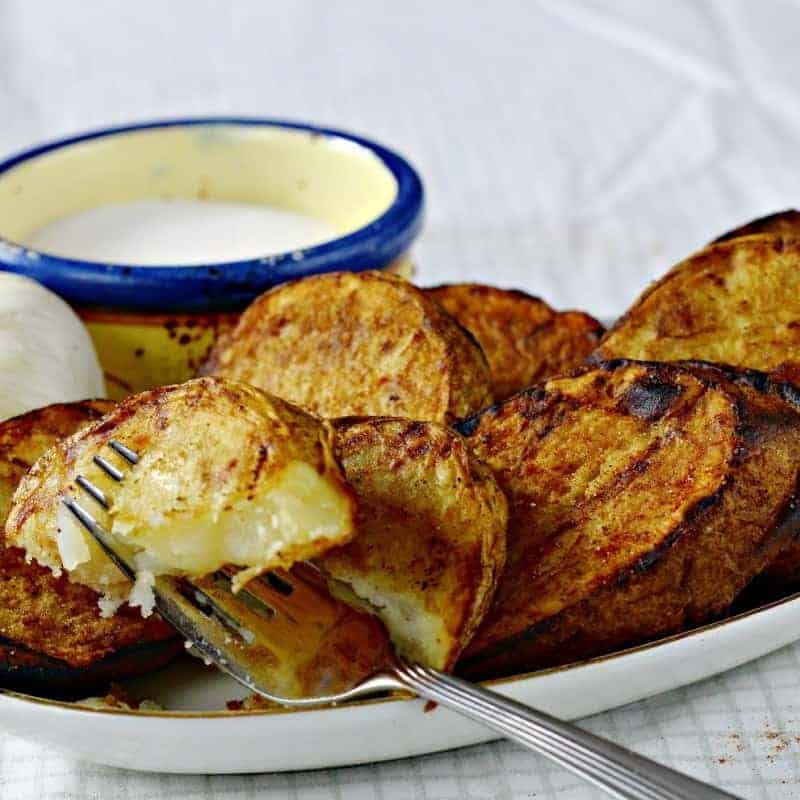 They can be so versatile and who doesn’t love a roasted potato? Seriously? 🙂 Thanks for sharing! Put potatoes in anything and I’ll have it (this time a blog post, hmmm ) ! I love grilled potato but have always grilled it whole and with a tin foil, this might be interesting to try out in my next BBQ. I work for a foodtech company called Chicory and we partner with WP Ultimate Recipe Plugin (which you’re using), so we wonder if you would be interested in becoming a recipe partner? I love the idea of grilling potatoes. These look soooo good! We enjoy grilling our potatoes as well. We will have to try them this way. Do you have a recipe? I’d love to try yours! There’s so many options! Let me know how you like them! These look so good! I love the idea of marinating potatoes. I’d use this as currency!! These look delicious and so easy to make! Pinned! Thanks! Definitely one of my favorite recipes. Thanks for sharing this gorgeous recipe with Tea Time Treats, I’m pinning these as well as they look so darn good! I need these potatoes in my life!!! Too funny that they were like currency at the BBQ. I will bookmark this and add it to a BBQ roundup so I don’t forget to make them. They are delicious! My dad came up with them, now he checks how many shares they’re getting on Pinterest lol! Thanks for letting my share on Facebook! OMW this looks amazing! I am definitely making these for dinner! Thanks for sharing! How do you think they’d fare if they were marinated for upwards of 24 hours? I’d like to try these on our upcoming camping trip but I would need to make ahead and transport in a ziplock. Thanks! I’ve never tried it for that long personally, but the marinade is mostly oil, so I think they would turn out OK. I would make sure they stay nice and cold in the cooler, and cook them within 24 hours. Raw potatoes can get brown spots (much like apples), so make sure they’re completely coated in the oil before you pack them. Let me know how it goes! I love camping, I might have to bring these next time, too! Can you narrate over night? Too long? Hi Rene, I’d think they’d be ok. Just make sure they’re coated well so they don’t turn brown.